The 2016 campuswide commencement ceremony for the University of Illinois at Urbana- Champaign will be held Saturday, May 14 at 9:30 a.m. 2016 will mark the institution’s 145th commencement and will be held at Memorial Stadium. Interim Chancellor Barbara J. Wilson invites all May 2016 degree candidates, August 2015 graduates, and December 2015 graduates to participate in the campuswide commencement ceremony. 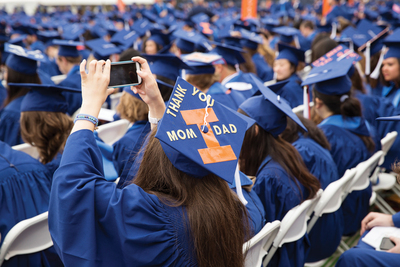 Participation information including registration, academic regalia, tickets, lodging and parking is available on the commencement website at commencement.illinois.edu. Participants must order academic regalia by 10 p.m. April 14 by visiting herffjones.com/illinois. Hotels begin taking reservations for commencement weekend a year in advance. Please plan ahead if your student will be participating in 2017 ceremonies.